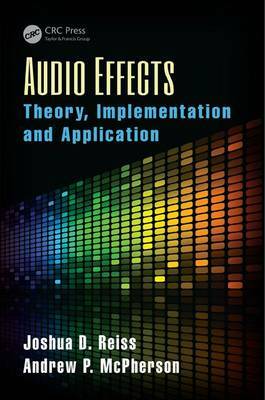 Audio Effects: Theory, Implementation and Application explores digital audio effects relevant to audio signal processing and music informatics. It supplies fundamental background information on digital signal processing, focusing on audio-specific aspects that constitute the building block on which audio effects are developed. The text integrates theory and practice, relating technical implementation to musical implications. It can be used to gain an understanding of the operation of existing audio effects or to create new ones. In addition to delivering detailed coverage of common (and unusual) audio effects, the book discusses current digital audio standards, most notably VST and AudioUnit. Source code is provided in C/C++ and implemented as audio effect plug-ins with accompanying sound samples. Each section of the book includes study questions, anecdotes from the history of music technology, and examples that offer valuable real-world insight, making this an ideal resource for researchers and for students moving directly into industry. "This book strikes a great balance between theory and get-your-hands-dirty applications. You get the essential math that deepens your understanding, but not so much that it discourages the motivated reader. The book is rich with actual examples-working code-so that you can build and hear functioning effects right away. The strong orientation to families of effects found in every recording studio means that readers of this book can look forward to making a full set of useful, relevant, real-world effects. The theory is just enough to arm you with the power to innovate and create, so you learn how to do what is shown in the book and, more importantly, to make your own extensions, variations, and inventions." "Audio Effects: Theory, Implementation and Application is a fascinating new book on audio processing algorithms. It starts from basics of digital audio engineering and signal processing, and then continues to explain in detail the most important audio effects algorithms. I very much like the chapter on delay-line effects, which gives a great overview of all the well-known methods, such as slapback and ping-pong delay effects, and flanging and chorus algorithms. This book not only explains the basic idea and applications of each method, but also briefly shows the mathematics in the background of all techniques. I much enjoyed reading the historical anecdotes about the origins of some audio effect techniques. Every chapter ends with a compact set of problems, which makes this book very useful as a textbook. Both easy and challenging problems are included." "This is a clear and concise guide to the details and applications of audio signal processing. The mathematical treatment of the subject is rigorous yet accessible, and problems to test understanding are included at the end of each chapter. Code examples in C++ are provided." "Audio Effects: Theory, Implementation, and Applications is a great book for those who are excited about the technical side of audio effects. Newcomers can gain a basic understanding of each of the topics and advanced students can take their understanding to the next level. The diagrams and formulae are in-depth and also function as a great one-stop reference on the subject." "In the book, audio signal processing is explained in a very nice and smart way. Mentioning and explaining system theoretic aspects of basic processing structures helps readers to understand them in detail. Besides that, the application of these structures in music and audio in general is described in great detail, and in a very motivating manner. The authors start with simple structures (e.g., with constant parameters), allowing for a simple entry. Afterward, variants (e.g., by allowing the parameters to be changed in a periodic fashion) are described that show how structures are used in practice. Additional C-code examples help if readers really want to get hands-on experience when implementing audio processing schemes." "... one of the best-written, best-structured, and most complete books on the topic of audio processing. ... The book uses dedicated chapters for a wide range of effects that take place in the time-domain (delay, reverberation, phase vocoder), the frequency domain (filters, Doppler effects, equalizers) or the realm of dynamics (overdrive, modulation, compression, etc.) and in each instance provides the theory of mathematical foundation using sophomore-level engineering math, clear and effective figures, excellent examples and exercises, as well as a short paragraph akin to a "did you know?" entry that lightens the reading. Whenever appropriate, the authors also include programming examples. From the excellent introduction to the final chapter (dedicated to building software plug-ins for some of the popular digital audio workstations environments), the book exalts clarity of thought and of presentation. ... What this book offers is an in-depth guide to how audio effects can be designed, calculated, and implemented in software. It is an effective text for college-level students in electrical engineering (or computer science) who have a passion for audio. ... Every reference book should have a good bibliography and reference section, and in this regards the readers will not be disappointed either. The references are both broad and deep, and they are extremely current. ... Personally I would not hesitate to spend the money on this work, as I can see annotating a lot of the pages (especially the code portions). ... a book of this quality should have a spot on an engineer's bookshelf." "... presents the application and implementation, from a technical approach, of the gamut of audio effects with a balanced focus on the math and science involved. ... There are a large number of well-placed references throughout the book for further reading or expanded research into filters and DSP effects. ... I would recommend this book to anyone interested in a behind-the-scenes look at how our modern DSP-based effects do their magic. The book also will help with understanding the math and concepts related to modern DSP-based effects."